What is Tamarind?..you ask. It is an absolutely superb fruit which grows on tall trees in South America, Asia and North Africa. The pods are about five inches long and contain seeds and a pulp that become sour when dried. 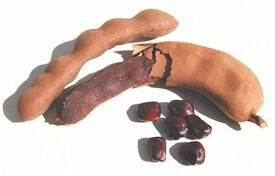 The pulp of the fruit is the main portion of tamarind used in food production. When still slightly unripe, it has a very sharp, sour taste with a high level of acidity. Unripe tamarind is used in many candies and dishes throughout Asia and Latin America. How do you go about cooking it? Home Cooking Rocks has done a good job showing you how to extract the juice. We like to use a cheese cloth instead…and we wring it out instead of using a fork and a a strainer. Don’t worry it will not stain your fingers.